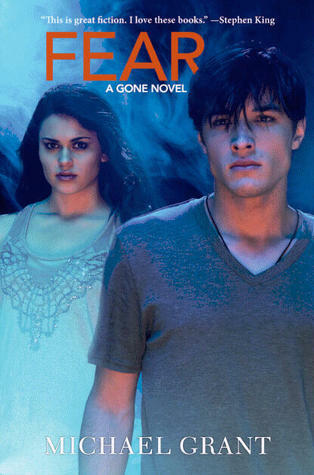 Book #5 in the Gone Series delves into the fear that invades each characters' life in the FAYZ in Perdid Beach; a fear of each other, fear of the parents who wait on the other side of the barrier hoping to find out anything about their children and now there is something happening to the barrier that surround them. It begins to turn black and move upward to the top of the barrier; blocking out light, stopping the fishing, the farming and the daily life activities the kids have been working on to eke out a living. Diana is pregnant and has left Caine and joined Sam and his boys. Lana is still curing everyone and living with Sanjit and his family on top of the hill. Astrid returns as a much different character in the previous books; she is lean, mean and has learned to live off the land and always carries a gun. Ork has become more sensitive but Drake and Brittney are still vying in the same body. Penny is used by Caine to punish Cigar; she tortures him and he almost dies. Once again, Grant does a tremendous job of terrorizing every child in the FAYZ and leaves this book and characters ripe for #6!